In this post, I summarize this event and add some information about the people -- civilians and police -- who were victims of the violence. 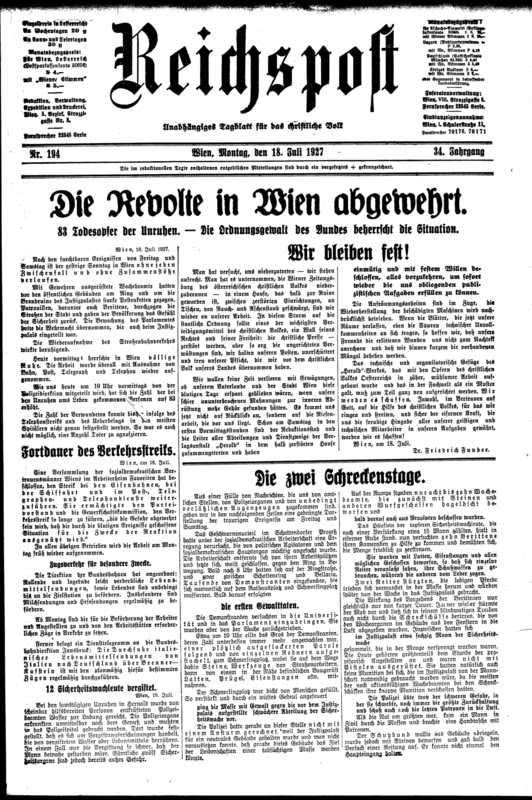 Summary of the "Days of Horror"
In brief, the "Schreckenstage" ("days of horror" or "days of terror"), as they were called by newspapers at the time, were pivotal for the future of Austria. They were a major setback for the Social Democratic Party, which had done well in the April 1927 national elections, narrowly losing to the Christian Socialist Party and its allies. Worse, they enabled the fascist Heimwehr to attract new members and increase its threat to Austria's democracy. The riots began as a massive protest against a court decision that had freed three men who had, admittedly, shot and killed two people (an invalid war veteran and his eight-year-old nephew) in a peaceful Social Democratic march in the city of Schattendorf. The court decision was rendered during the evening of July 14, 1927. From most contemporaneous accounts, the protest on July 15th arose spontaneously, catching both the police and Social Democratic leaders by surprise. Huge crowds of workers and other supporters of the Social Democrats assembled on the Vienna Ring near the University, City Hall, and the Parliament Building. Reportedly, the workers planned to march from the working districts of the city to the parliament and ministry of justice (located across a plaza from the parliament building), then return to their work places and homes. The crowd numbered, at its peak, about 200,000 people or more. At about 10:00 a.m., the flow of the crowd was blocked at the plaza in front of the Palace of Justice building. This building was guarded by a small number of lightly armed security forces. For some reason, a small Calvary unit rode into the large crowd on horses, with sabers drawn, apparently to try to drive it back toward the Ring. Shortly after that, police security officers fired their pistols into the crowd from the steps of the Palace of Justice. Enraged, some members of the crowd armed themselves with bricks, tools, boards, and other materials they obtained from a nearby building site. They successfully stormed the Palace of Justice, forcing the police to retreat to higher floors of the building. Shortly thereafter, the building was set on fire. When the fire department came to fight the fire, its trucks were stopped by the crowd which refused them access to the burning building. The violence escalated in the afternoon when large numbers of police officers came to the Palace of Justice area, and other parts of town, armed with heavy rifles, and began to shoot at groups of people on the street. The leaders of the Social Democratic Party, belatedly, sent members of its militia, the Republican Guard, to the streets to help calm the crowd. It exhorted Party members to return home. Also, it called a national strike of transportation and communication workers to protest the shooting. At the same time, it refused to provide protesting workers with weapons from its huge arsenal, which included rifles and machine guns. The clashes between protesters and police continued into the night of Friday, July 15th. By July 16th, the violence had greatly declined, though skirmishes continued. 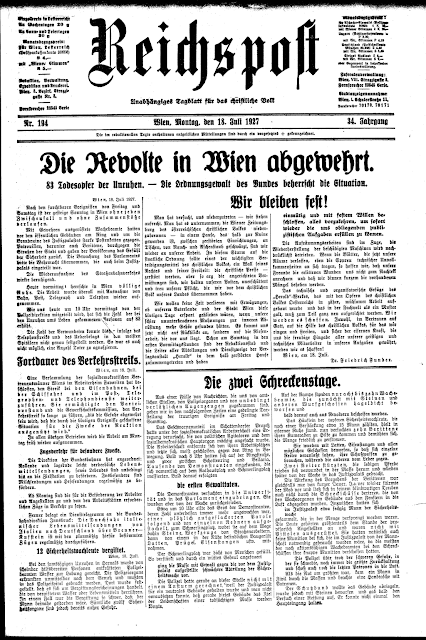 On July 17th, encountering strong resistence in the country's provinces to its strike, and hearing of plans by the Heimwehr to assemble an army to march into Vienna, the Social Democrats called off the strike. 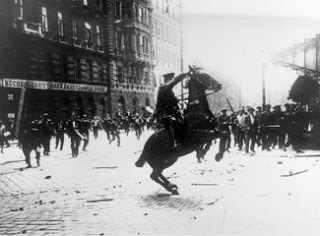 During the three days, about 85 marchers and bystanders were killed, as were four police officers. About 600 police officers were wounded, 120 of them badly. Between 300 and 500 civilians wounded. Over 1,500 people were arrested. The Social Democrats described the events as the indiscriminate, unnecessary use of deadly force by the police against peaceful protesters at the instigation of the Chancellor and the head of the Vienna Police. 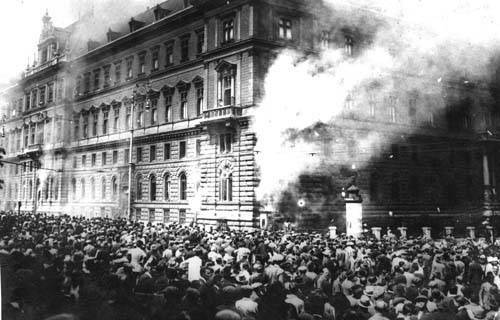 Lamentably, some workers, enraged by the violence used against them, retaliated by burning the Ministry of Justice. 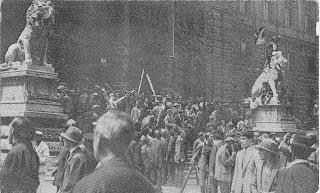 According to the ruling parties, the Christian Socialists and their allies, the event was caused by a mob, some of whom were armed, that attacked the Palace of Justice. Police officers fired at members of the crowd threatening the Palace of Justice after they were fired upon. The mob violence was due largely to agitation by communists and other provocateurs. The government responded with the force needed to restore order. 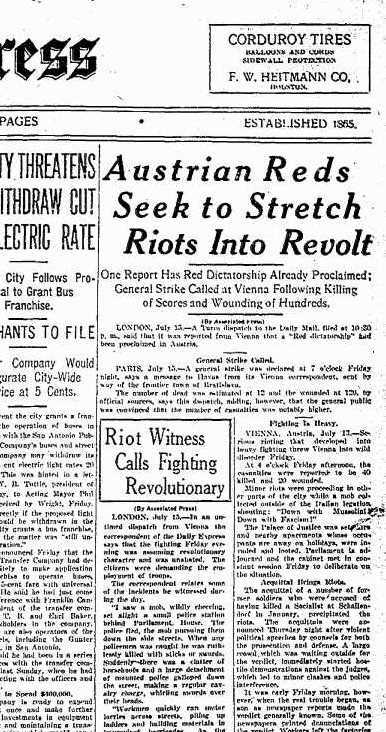 Finally, the Heimwehr and other right-wing groups painted the event as a planned revolution to overthrow the Austrian regime and create a Bolshevist government. This revolution was conceived and supported by Moscow and communists from other countries. The coup was narrowly averted by the actions of the police assisted by the Heimwehr. In retrospect, it seems clear that "communists" played a very minor role in the Schreckenstage. No evidence supports the assertions that they (domestic or foreign) planned, led, or influenced the riot in any significant way. While individuals who identified themselves as communists may have urged others to violence, or engaged in it themselves, it is unproven that they made a deliberate effort to try to overthrow the government. In fact, communists were not popular in Austria, even in "Red Vienna." In the elections held in April 1927, the Communist Party received only 70,000 votes out of over 3.6 million cast (less than two percent) in Austria. In Vienna, the Party got only 10,000 votes. They had no seats in the Austrian Parliament. As one Social Democrat, a foreman at a Vienna soap factory, told a New York Times Reporter, "It is nonsense to say communists were instigators. There are not enough communists in Vienna to instigate a dogfight, much less a revolution." 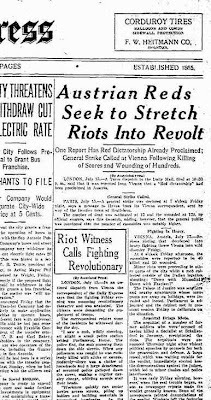 The July 15th and 16th events deeply shocked Austrians, including Viennese, and they had no taste for a continuation of the violence. The journalists who rushed to Vienna to write the latest story of a revolution, arriving on July 17th or later, were surprised and disappointed to find that life had quickly returned to normal and they had little about which to write. While the different sides identified villains they blamed for the violence, they did not direct anger at those most directly involved in the rioting and shooting. For example, the Social Democrats blamed the Chancellor and head of the Vienna police, but suggested that the individual police officers who did the shooting were simply doing the bidding of their bloody leaders. The Christian Socialists blamed communists (mainly foreign communists) and Social Democratic leaders for the violence, but did not direct their propaganda against the workers who took part in the march or those who were killed. 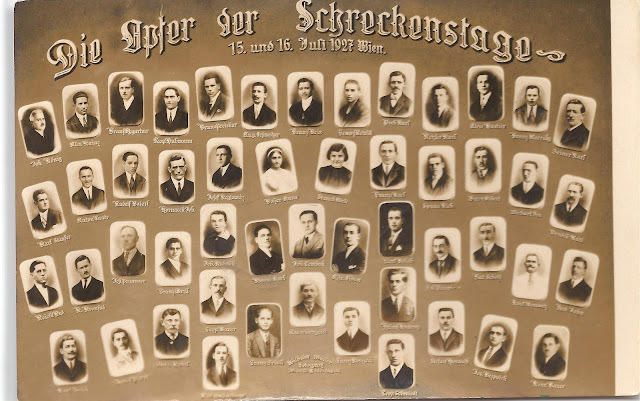 With a general cease fire, and a large amount of tolerance, the national government allowed the Social Democrats and the city government of Vienna, dominated by Socialists, to bury the dead civilians -- most shot by the Vienna police -- in an elaborate ceremony on July 20th. While it limited the number of people who could attend the burial -- keeping thousands at a distance, the national government also the limited the visibility of police and soldiers in the city. Crowd control for the Socialist funeral was left largely to the Republican Guard. At this funeral, fifty-seven civilians were buried together in a mass grave at the Central Cemetery of Vienna. According to a New York Times story, "They were the victims whom the municipal authorities had offered to inter in common graves and whose relatives had accepted the offer." Behind the double row of coffins...were standard-bearers representing various Socialistic organizations, each carrying a red banner draped in black with black crepe. Behind these the wall of the cemetery rose up hung with great sheets of black cloth and before which were funeral lamps emitting smoking yellow flames. Punctually at 2 o'clock the funeral strains of a military band caused hundreds who gathered in silence before the cemetery gateway to whip off their hats and bow their heads. Then came speeches by Acting Burgomaster Speiser, and several Socialist leaders, one of whom, Herr Bernstein, flew from Berlin in an airplane as the representative of the German Socialist Party. After the singing of the dirge by the choir, the relatives of the victims moved sorrowfully toward the coffins and took up positions beside their dead. The first person borne in the funeral procession today was that of a little child killed by a bullet while it was carried on the arm of its father during Friday's bloody rioting. Next followed the body of a 15-year-old girl, who was shot while watching the street fighting from the roof of her house. 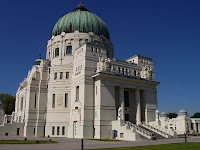 A day after the Socialist Party funeral, on Thursday, July 21, 1927, the four police officers killed in the rioting were buried with full honors in a state funeral attended by the President and Chancellor of Austria, by the heads of Austrian Ministries, and by "representatives of all professions and elements of society. 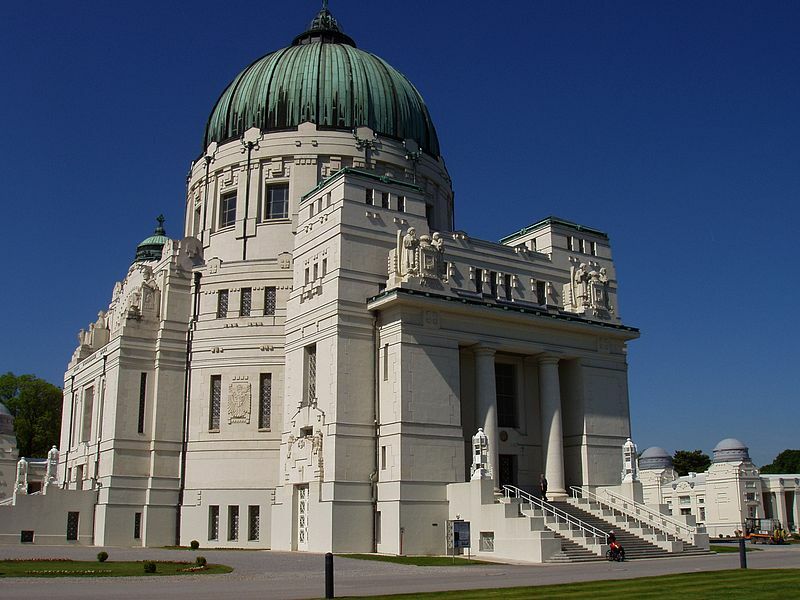 This elaborate funeral was also held in the Luegar Memorial Churcha located in Vienna's Central Cemetery. Social Democrats made no attempt to disrupt it. 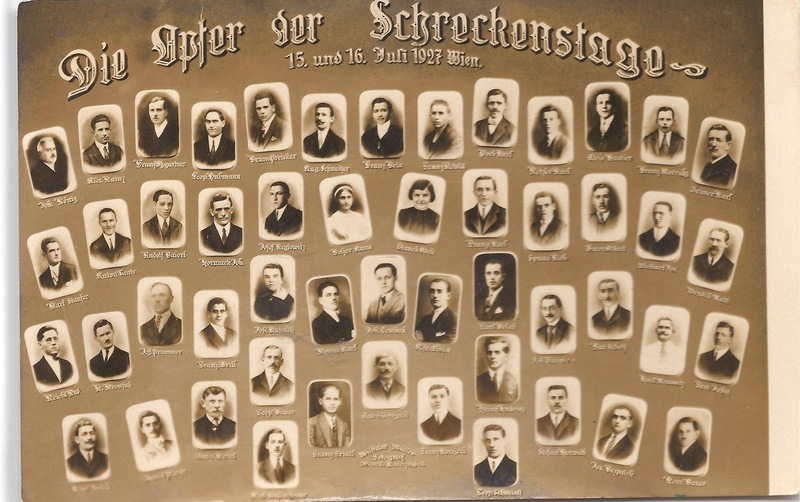 A postcard was published with the names and pictures of 54 of the civilians killed on July 15 and July 16, 1927 during the clashes in Vienna.